(Scroll down for video) It remains unknown why a student walked into class, apologized and then shot himself, according to police. A freshman at North Dakota walked into his class one morning, apologized and then shot himself with a gun, Richland County authorities said. 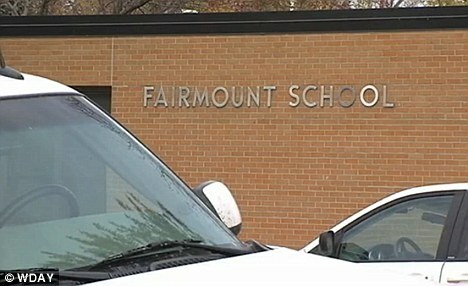 The wounded boy was coherent when he was taken to a hospital, director Jay Townsend of Fairmount Public School said. The school has 112 students from kindergarten through grade 12. Authorities do not know what the apology was for, Sheriff Larry Leshovsky said. The student was not in any kind of problems that the school was aware of. The freshman, whose name has not been released, has lived in the small rural community of 380 people all his life and has spent all the years of his school education in Fairmount, Mayor Jon Nelk said. The student was taken to a hospital in Fargo, but the mayor did not elaborate. The student's grandparents grew up in the area of Fairmount and his parents have lived in the city all his life, Nelk said. "As far as I know, he's a good boy," the mayor said. "We are a rural area, but weapons are not common." The shooting was an isolated incident in the city, Nelk said. "I'm sure when we sit down tonight and start looking back, we will figure out what could have happened and why this happened," said Nelk. "It's a very tight community. I have had many conversations with parents and some students. They are very concerned and our prayers are with the child, family and friends," the mayor said. A teacher provided first aid to the child, and the school went into lockdown shortly after the 8:40 am shooting, Townsend said. A warning call was sent to all parents that school was canceled for the day, Townsend said. "This has never happened here before," Townsend said, who has been principal for five years. "This type of situation is very rare and new to North Dakota, the community, the school and the students."